“Focus on the user and all else will follow.”1 This is the opening statement of Google's guiding principles entitled 10 things we know to be true. That document sits within the 'about' section of the company's website. Tucked away from beloved products like Google Search and Gmail, it's this statement goes unnoticed by most of the millions of people who use Google's products each day. Despite the fact this statement isn’t exactly being shouted from the mountaintops, Google chose to lead with it. Why? Google leads with this statement because they are keenly aware of the fact that focusing on the people who use their products and designing experiences geared for them is a key competitive advantage that has helped fuel their dominance. They know that creating a bad experience leaves a lot of room for the competition to enter the picture. Great user experience isn’t something that is afforded because of business success. Experience design enables success by creating systems that people will want to use from the beginning. In technology, entire industries are cropping up around the premise of providing a better user experience. Over the course of numerous projects, we have found that enterprise companies face market share erosion at the hands of new entrants because they cannot provide a passable experience. This is usually due to a belief that the organization lacks the time, resources or corporate backing to make something great. One of the basic tenets of practicing experience design is to break down information into consumable portions. This runs contrary to what many in the “conversion optimization” schools might tell you. Conversion-driven thinking is based on the idea that fewer steps lead to increased conversion. “I should be able to find it in three clicks,” or, “I should be able to buy in five clicks.” Stop counting clicks. They are a meaningless measure of effort. 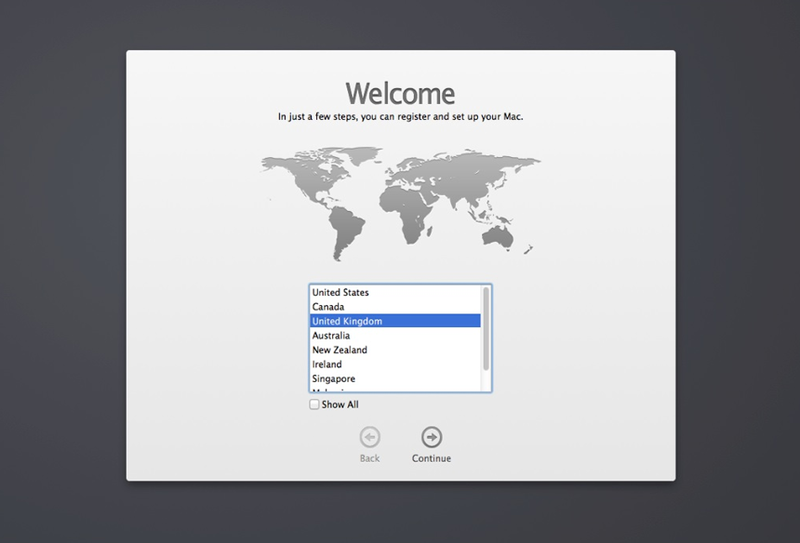 Consider the Apple® OS setup process and migration assistant, for instance. The entire process of setting up the operating system requires one to make dozens of unique decisions. Despite this, the process only takes about 15 minutes to complete; minus any major file transfers. Most of the time spent in this process involves letting the machine play digital moving van. If we mapped out the entire setup process, it would look really long. It’s a lot to ask people to go through, but ultimately is not an overwhelming experience because people are never confronted with more than a few decisions at any given moment. 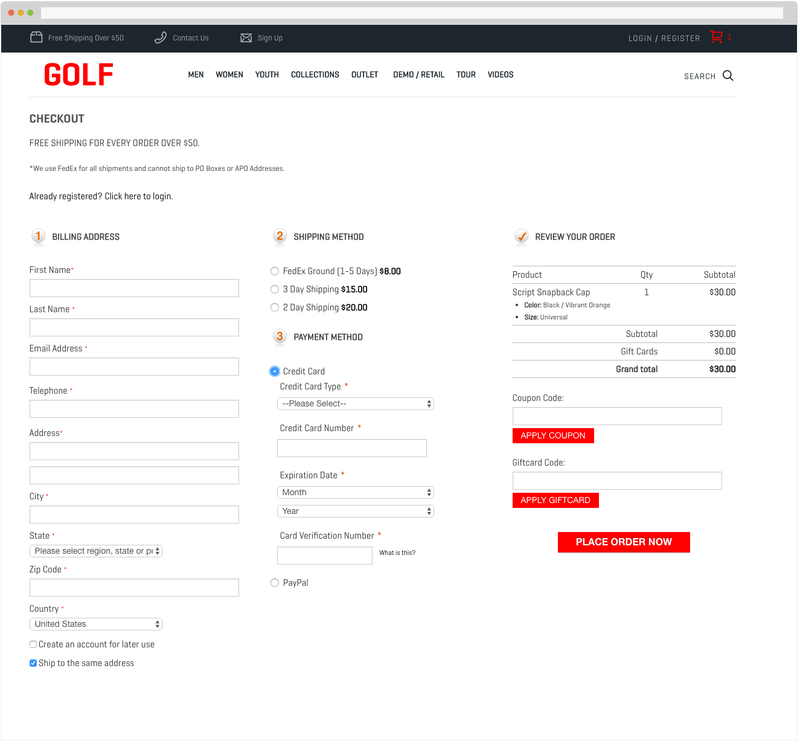 By contrast, look at something like a single-page checkout, a popular feature on many e-commerce sites. The total unique decisions that a person would need to make is much less, about 20. The issue here is that people are being asked to make them all at once. You might as well ask them a thousand questions. Throw in a couple instances of bad error handling and you’ve got a single step nobody can get through. In no industry is user confidence more paramount than in financial services. Even the slightest misperception of a fragile system can be cause for customer abandonment. 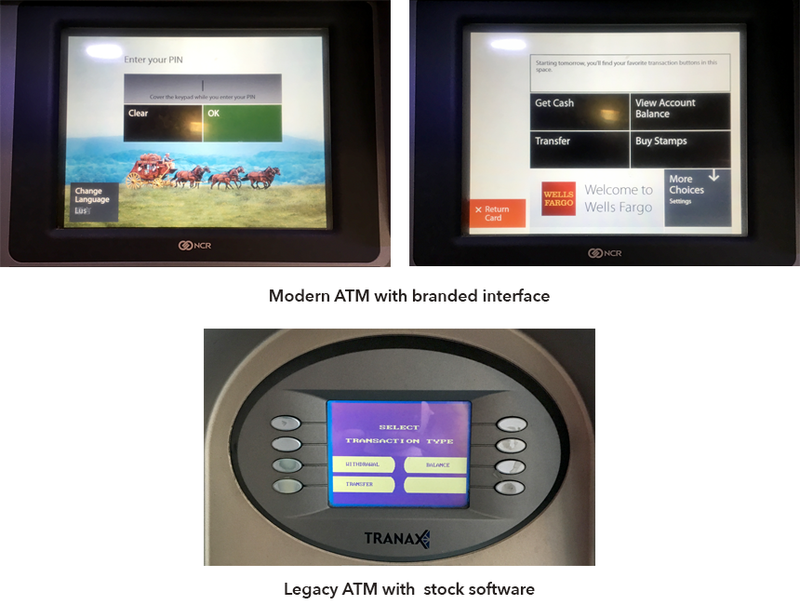 Let’s compare two ATM interfaces: One is designed for modern hardware where customer experience has been highly considered; the other is designed for older hardware with software that is barely functional. On the modern ATM’s interface, the action items are clear. The brand supports the overlying transaction that is pleasing but not intrusive. The path to navigate forward or backward is clearly established with the use of color. The touchscreen interface allows for direct interaction with the action items and their labels—not only is the interface more pleasing and confidence-inspiring, the physical interaction is actually much stronger as, it requires less mental overhead to process. The outdated ATM leaves us with no interface and very little indication of how to move forward or backward in the process. To make things worse, the hardware is actually hurting the interface as labels are disconnected from the action buttons, thereby increasing the mental overhead in using the system. The more complex the system(s), the greater the exhaustion can be. iCloud and Apple photos are becoming widely admonished for exactly this reason. Five years ago, a thermostat was something that had only marginal consideration for experience design. Some were programmable, but the headaches in using one of them were... well, many. Then the Nest® Learning Thermostat™ came along and yet another mundane appliance became an object of desire. It’s a product that’s been celebrated ad nausea in the press. However, it’s a great example because it proves a very important point: experience design took something nobody thought of or cared about and made it into something people wanted. Crossing the psychological barrier from necessity to desire is an advantage that is really hard to overcome. If you’re not convinced, let’s compare Nest with its competitor: The Honeywell Wifi Smart Thermostat RTH9580. Ignore the obvious disparity in names — you don’t need to be a brand guru to see the problem. Both products achieve the same thing: Keep your home at a comfortable temperature. Both are network-enabled. Both come with an app to extend the experience. The differences, however, are in how people interact with each product. If I were to reverse-engineer functional requirements and user stories for both products, I imagine they would end up looking very similar. Nest, however, is by all measures a better designed and executed product. Its interface is streamlined and simplified. The hardware is more aesthetically pleasing and desirable. This difference is so pronounced that Honeywell has released a direct copy of Nest to effectively compete. They allocated budget. However, let’s not let something like budget tell the whole story. Let’s do an informal test with some actual sales numbers: How are they selling on Amazon? The Nest Learning Thermostat has over 3,500 Amazon reviews and sells for $249.00. It's also labeled as a category best seller. The Honeywell RTH9580 has just over 1,700 reviews and sells for around $167.00. Amazon numbers (highly extrapolated ones at that) are hardly a perfect metric. There are numerous variables that impact whether or not a product is successful in a given sales channel, but it does pass a common sense smell test when you compare the two. As you can see, Nest has more reviews, more purchases and is a clear category leader despite a marked increase in price over Honeywell’s product. We can assume that’s about a 2.8X increase in revenue for that sales channel. In fairness to the Honeywell product teams, the newer Lyric Thermostat is a pretty successful design in its own right, and has been getting some pretty solid praise for going the geo-fencing route over Nest’s learning algorithms. Both are better interface options that require a lot less effort to use — and that’s what really counts. Time saved with better products. Less reworking means less time in the end. You may invest a little more upfront in developing real compassion for user concerns. However, the investment almost certainly means in the long run you’ll save time. Take time to aim in the right direction and you’ve got a much higher likelihood of hitting the target. Smarter short-term allocation of funds. Focused effort means focused investment in the near term. It’s easy to flail away at adding features, but it’s more efficient to validate that those features are worth the time. There’s nothing worse than investing time into something that ultimately is of little value. Decreased risk. Make no mistake, if you are developing any kind of digital product or service your chances of failure are very real. Experience design isn’t going to eliminate that risk entirely, but having a product with any edge for adoption is going to be better positioned for long- term success. Consideration of end users means less risk of failure once the product launches. Increased referrals and adoption. We don’t evangelize products that just meet basic expectations. There has to be a certain level of excitement and joy in using a system before you’ve crossed the emotional barrier into something that people will take the time to refer. Consider whether enough is being done to break through that barrier. Decreased need for training. Great software, more specifically, software with a great user experience has a much lower barrier for entry. If people just “get it,” the end result is less training for your user base. Less training means lower adoption costs for an enterprise level company. There is no magic number, but it’s entirely within reason that the cost of training even a few hundred users on a system may exceed the cost of launching the whole project if you factor in all the disruption and lost time bad systems engender. Quite literally, in fact. If you want to take a real life look at these principles playing out right before us, you only need to look at the forces at work within the Fintech industry. Players like Mint, Simple and Acorns came into being solely because the traditional institutions failed to offer digital products that their customers find relevant to their needs. Many large institutions view these upstart forces eating away at them as annoyances to be brushed aside for acquisition. That’s missing the point entirely. These new market entrants exist solely because the opportunity was given to them. That opportunity came about because of frustrated users and unmet expectations. Nothing more. The path to creating a desirable experience isn’t always clear. It takes an experienced guide and the fortitude to change direction when the evidence suggests that the hypothesis is wrong. That means both the sponsor and the designer need to divorce themselves from the idea that they alone are in the right. Nothing you create is about you, it’s about how the people you’re creating it for will use it. Be respectful of their time and energy and you’ll gain an edge. Focus on the end user and all else will follow.  Looking for more on how to leverage user experience to your company's advantage? Read, "Design from the ground up: leverage UX to build the right products."